Hello all, hope you're well? I'm yet to put my Five Take post up, hoping to get the photos done today, I've been having camera problems so I've been relying on my iPhone which requires another set of hands (i.e. Mr BeBe) anyway, in the mean time I thought I'd put a little post up about a couple of emails I've had through and a trend I've seen becoming more and more apparent within the plus size clothing arena - shape dressing. No, it's not a new thing, women have been advised since time begun to accentuate their waistlines, avoid x, wear y, the likes of Gok Wan and Nicky Hambleton Jones have made a living out of it, but, of late it seems to be popping up on every plus size retailers websites and shop windows. Now I like to dress well, I like to wear clothes that make me feel good, but something about being dictated to about what I should and shouldn't wear sits most uncomfortably with me. If I think an outfit requires a belt I'll put one on, but I won't wear one for the sake of it to "accentuate" my waist. My legs are not the most amazing of pins, but if I want to wear a short skirt or cut off denim shorts by jove I will! I'm also not all together comfortable with being likened to a fruit or an implement that tells me when my boiled eggs are done. 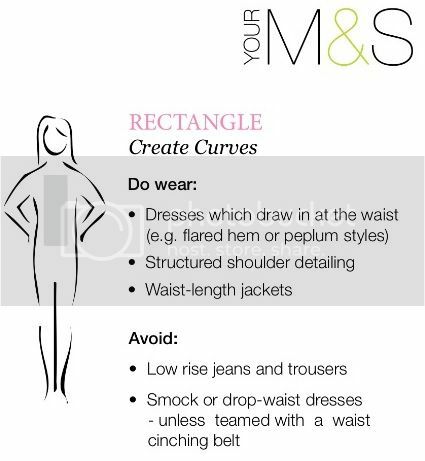 But, in the interests of balance I have to say, if you're not body confident, or a confident dresser and these shape guides make you feel better about your shopping trips, who am I to judge? I just want every woman, plus size or not, all shapes and sizes to feel confident in their clothes and ultimately their bodies. And it may be a bit of a chicken and egg situation but once you feel body confident you will feel clothes confident, but clothes confidence may just make you feel more body confident...hmmm. What are your thoughts on shape dressing do you love it, do you adhere to the rules, or are you a clothes rebel, do you follow your gut and wear what feels good? Like I just said on twitter, i ignore almost all of the rules, but some I follow like belts, not because I am told I should but because I like the shape it gives me, these guides can be good for some women I think as something especially like me a few years ago in a clothing rut, living in jeans and a tshirt 24/7 it helped me to find my way a little bit and make some changes to my wardrobe. Fortunately most of the clothes I'm drawn to are ones that are supposed to be flattering for my shape. However if I fancy wearing something that doesn't necessarily work for my shape but I feel flippin' marvellous in it, I'll wear it! I think for some women who moan 'I don't know what suits me', and who wear baggy things to 'hide', it is a good first step to take to caring about what they wear. I also think that we're not the norm here. Most of the wider plus size community - and I'm using my Mam as a test subject here - don't like bold prints, and like rules to follow. For the wider community it is a good idea. We're just the exception in most cases.